Last Departure: 5 pm (October to March), 7 pm (April to September). We are comparing Rome Hop-on Hop-off Sightseeing Tour Prices from leading ticket suppliers and Try to find you Cheap tickets prices on the market. 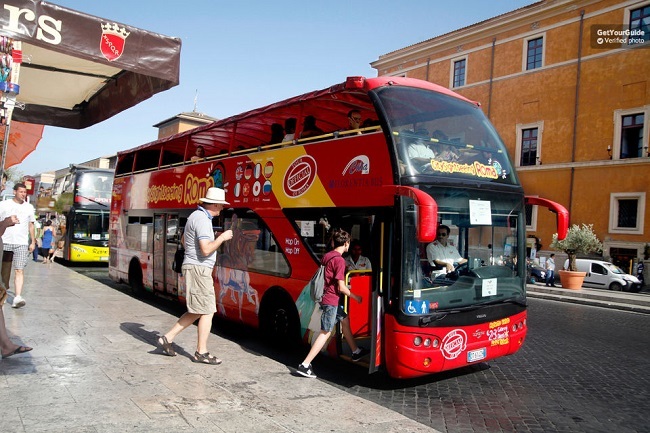 The Hop-On Hop-Off City Sightseeing Bus gives you the flexibility to make your own itinerary and explore the legendary city of Rome at your own speed. Choose to ride the bus for the full circuit or jump of at any of the designated stops. Each of the 8 stops is located close to one or more of Rome's best attractions, museums and squares, including the Colosseum, Vatican City and Piazza Venezia. You can join the bus from any of the stops. This is a fantastic option for disabled visitors, families travelling with youngsters or for individuals to see the city. Relax on the open top deck with an engaging audio guide, enjoy panoramic city views and save your legs for exploring underground crypts or climbing one of Rome's 7 hills. And, don't forget to take advantage of the free onboard to download the Rome Hop-On Hop-Off City App. This 24 to 72-hour tickets is perfect for people who want to see a lot of the city and visit many attractions during their stay. This semi-independent tour is can please a range of visitors, people who like history will like the onboard audio guide, while others can enjoy city views. This is a good option for disabled visitors who prefer to see the city without an organised tour. Your Experience With Rome Hop-on Hop-off Sightseeing Tour? Discover the City of Rome at your own pace with the Hop-On Hop-Off Sightseeing Bus. Choose from a 24, 48, or 72-hour ticket and learn about this ancient city with a multilingual audio guide. Hop-Off at any of the 8 city stops, located close to all the top city attractions, and jump back on whenever you want. Benefit from onboard Wi-Fi and free Hop-On Hop-Off app. What Rome Hop-on Hop-off Sightseeing Tour Includes? Access to all Hop-On Hop-Off City Sightseeing Buses for 24, 48, or 72 hours. (Select ticket length when booking). Free onboard audio guide in English, Italian, Spanish, French, German, Russian or Chinese. Free onboard Wi-Fi and headphones. Terminal A, B, and C, Piazza dei Cinquecento. Unbiased comparison of Rome's Best Hop-on Hop-off Sightseeing Tours operators(Rome Big Bus Hop-on Hop-off Tour, Sightseeing Roma Bus Tour, Roma Cristiana Open Bus Tour, and I love Rome Gray Line Bus tour) based extensive research, Tripindicator team came up with comprehensive recommendations for Family with kids, Couples and Single travelers which helps you choosing Best Rome Hop-on Hop-off Sightseeing Tour suitable for your travel. Unbiased comparison of Rome's Best City Passes /Discounts Cards(Roma Pass Vs Omnia pass vs Rome City Pass vs Vatican Rome Card, Vatican Rome Travel Card vs National Roman Museum) based extensive research, Tripindicator team came up with comprehensive recommendations for Family with kids, Couples and Single travelers which helps you choosing Best Rome City Pass suitable for your travel. Travelers Reviews about Rome Hop-on Hop-off Sightseeing Tour? Reviews for the Hop-On Hop-Off service in Rome are mostly positive, travellers say that you can cover a lot of the city in just 1 to 3 days and recommend the pass for people travelling with children or seniors. Over all this tour has earned 3.9-stars from Get Your Guide users and 4 out of 5-stars from nearly 4,000 reviews on TripAdvisor and Viator. There are some negative comments which come from customers who say that the route is quite short compared to other cities. Please bring voucher in electronic or paper form to collect your tickets. Tickets are refundable however a cancellation fee may be charged. No refunds will be given within 24 hours of departure. Buses run every 10 minutes from April to September and every 15 – 20 minutes from October to March. Entrance to attractions is not included. City Stops are located at: Terminal A/B/C of the main train station (Rome Termini), Santa Maria Maggiore, Colossium, Piazzale Ugo la Malfa/Circo Massimo, Piazzale Venezia, Vatican, Fontana di Trevi (or Piazzale la Spagna), Piazzli Barberini. Join the Hop-On Hop-Off Sightseeing Bus at any of the 8 designated stops.